American Elderberry plant (Sambucus canadensis) is closely related to Black Elderberry (Sambucus nigra). These two species are considered by many to be botanically interchangeable, both possessing strong anti-viral properties. Flowers and berries used as a tea, with a potent anti-viral syrup made from the mature (black) berries. Leaves are an insect repellant and used as a spray for aphids and caterpillars. Also added to compost. All parts of this tree have medicinal properties. Note: Immature uncooked berries are toxic. American Elderberry plant is native to northern america and is adaptable to any type of moist soil. Prefers partial shade in a protected position. Frost resistant but drought tender. 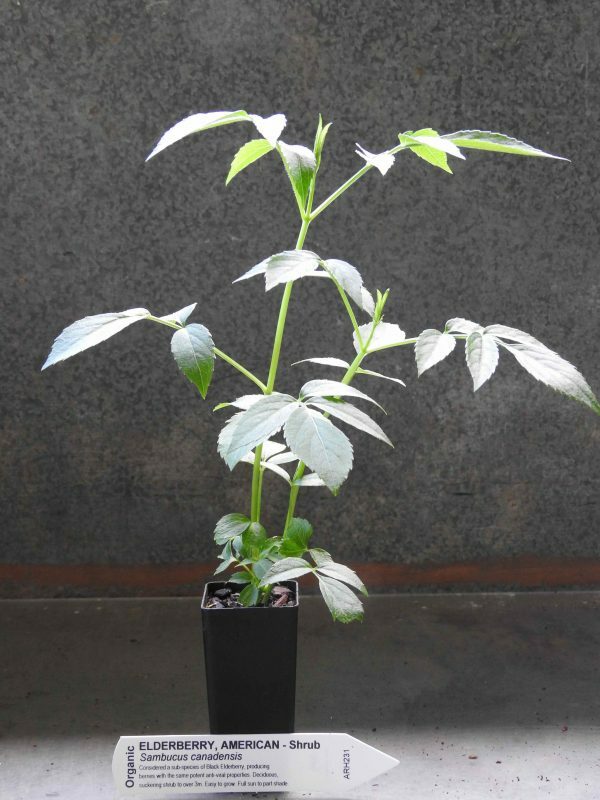 Perennial spreading shrub, growing to 3m x 3.0m. Be the first to review “Elderberry, American plant” Click here to cancel reply.